As you can imagine, this book is my most sentimental release. The transgender identity is still very misunderstood by mainstream society. I wanted to write this book to help shed some light on an important topic and to debunk some of the myths propagated by those with nefarious intentions toward the LGBT community. Please share the book around to help spread the message if you feel so inclined. I also ask that you leave a review, as this is the quickest and easiest way that books get noticed in a crowded market. I hope you enjoy The Transgender Manifesto as much as I enjoyed writing it. Life is easier when you’re not carrying a burdensome leviathan around on your back. Repression went out of style with the Puritans. Time to usher in the era of a new America. Thank you. What is an “Indie” Author? This a question that I’ve seen countless times over my writing career and wanted to weigh in. If you follow any book blogs or book related accounts on social media, you’ve probably seen the term “indie author” used before. While there are countless memes that say “support indie authors,” there’s also a fair amount of confusion as to what the term really encompasses. Much of this blame falls on the word itself. People take indie to mean independent and therefore, self-published. That’s a fairly logical train of thought. Except for the fact that indie is a term that’s been used in the arts, including literature, for far longer than self-publishing has been a prominent practice. Indie films aren’t necessarily completely funded without studios and indie music isn’t always recorded without labels. To say that indie books must only be self-published takes an unrealistic deviation from the way we’ve used the term for decades. Indie doesn’t mean independent. It means, independent from a major backer. The film, music, and publishing industries all have similar structural hierarchies in the sense that the top is dominated by a few huge companies, with smaller companies further down the ladder and self-funded artists at the bottom of the ladder. For publishing, indie encompasses the books outside the big five: Hachette, HarperCollins, Macmillan, Penguin/Random House, and Simon & Schuster. Vague, right? Well, it’s kind of supposed to be. All the word “indie” reflects is the lack of a behemoth company producing the book. For those looking for a term than separates self-published and traditionally published books, you’re in luck. There’s an easy way to tell the two apart. Self-published books are self-published and traditionally published books are published through a publisher. So why the indie label if we have easier terms to tell books apart based on their production history? There’s a simple answer for that too. Aesthetics. Calling yourself an indie author is a lot more fun to say than telling people you were published at a small press. Say “indie” and “small press” out loud if you don’t believe me. Furthermore, the word “self-published” is still stigmatized by many people. In that regard, indie serves as a euphemism to use to those who may not check out your work otherwise. Is it useful? Those memes exist for a reason. Some readers do like to feel like they’re supporting the underdog. There is of course, the flipside, the people that may view indie works as of a lesser quality. There isn’t really a right or wrong answer. There is however, something to be conscious of with labels. I see authors who both traditionally and self-publish call themselves “hybrid authors,” a horrifically clunky term. Calling yourself a hybrid author essentially validates the self-publishing stigma as you admit that there’s a difference between traditionally and self-published work. Beyond that, it’s a branding nightmare. Do you think an average reader knows what a hybrid author is? Do they care? As an author, you need to be conscious of the image you project to y our readers. I see authors complain that their blog posts aren’t translating into sales when their blogs are basically all writing talk that an average reader wouldn’t find interested. I created ASOBAW to have a place to talk about books, while my general interest articles remain at my author site. Does the indie label matter? Kind of. I don’t particularly think of it as a big selling point, but the amount of people who fumble to define an intentionally broad term is concerning. Pick your labels wisely and for good reasons. Me? I’m just a writer. You should read my stuff. These days, anyone can be an author. You can type gibberish into a document and upload it to Amazon and voila, you’re an author. Which isn’t to belittle those of us who actually put effort into our work, but rather to provide an accurate view of the playing field. Some authors put no effort into their bios/product descriptions, leaving blatant typos/errors for all potential customers to see. The first step toward building a fanbase is to look professional. You’re someone who has set out to convince people to pay money to read your work. It’s important to show that you take pride in that opportunity. Making an Amazon author profile is important, but also incredibly easy. The whole process can take five minutes if you want it to. The question is, should you want it to? Of course not. It’s easy to spot the lazy ones. So don’t be one of them. So where does the selfie come in? People like selfies. 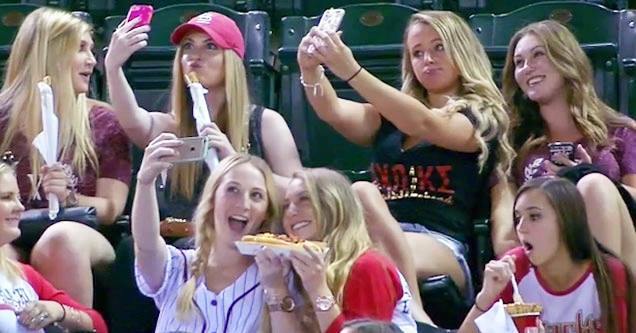 The selfie stick will likely grow to be a billion dollar industry. Chances are, your phone or computers has some selfies on it. When you’re making an author profile, which requires a picture, it can be awfully tempting to put a selfie up there. The answer is simple. Professionalism. You know, the thing that shows you’re serious about providing a quality product that people should pay hard earned money for. Many authors work on shoestring budgets and simply don’t have the money to hire a photographer for headshots. You don’t need to hire a professional to look professional. All you need is an Instagram filter and another human being. I mean that. If taking an author photo was harder than asking someone to take your picture, I wouldn’t write this article. I get that it’s harder to ask someone for something than doing it yourself, but is that really an excuse? Am I overthinking this? You may think so. You might have a selfie as your author photo. But consider this. Would you have a selfie as your LinkedIn picture? If the answer is yes, then fine. Leave the selfie. Your author picture isn’t really for you. It’s of you. It’s for your readers. In many ways, it’s the first connection you make with your audience. Regardless of what you choose to do, be aware of that.